This is not a planned or staged informercial, but one of my students spontaneously reviewed the value of her piano lessons by Face Time, and I snatched her critique on my iPhone. NOTIFICATION: She was not impeded from sharing the down side of her piano learning experience so naturally I was riveted to what would pour forth from rural North Carolina to provide me important feedback. April and I began lessons by Skype, but in this particular connection we had audio issues, so we decided to try FACE TIME, which was like night and day, by comparison. A few of my ONLINE students have made the same transition, and the transmission greatly improved. 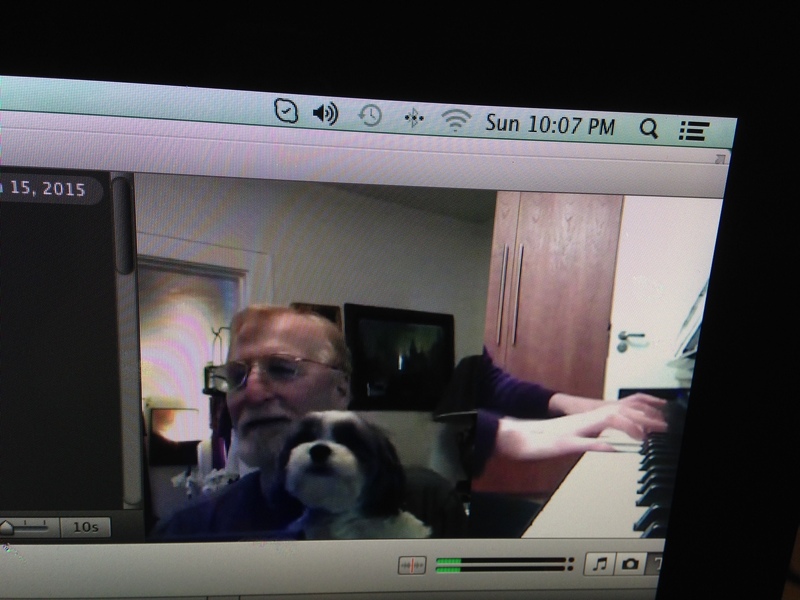 Below is a lesson segment beamed by Face Time from Berkeley CA to North Carolina (The only problem with FACE TIME Record at the time, was it only provided SPLIT SCREEN views on record playback, so the keyboard was therefore attenuated)–UPDATE: FACE TIME CALL RECORDER now has a three-view RECORD option. LOCAL (Full-screen), REMOTE (Full Screen) and SPLIT SCREEN. She had been my LIVE student in Fresno for 7 years before I moved to Berkeley. She then transitioned to ONLINE lessons. Yet, Skype has worked exceptionally well in transmissions from Berkeley, CA to Staten Island, New York. FROM David, a piano student who used to commute for LIVE lessons from CHICO, CA to Berkeley and currently signs on weekly by SKYPE. doing with a clarity that sitting at the piano next to you doesn’t allow. Chico. It’s nice to “get outa town” once a week. in-person, and better in some respects. So the testimonials have played out, and I’m spared from looking into a camera and sounding like a politician running for office. My NEXT Stop: The Music Teachers Association Branch Meeting in Oakland to spread the gospel about braving the new technology/teaching piano ONLINE–May 11, 2015–Where: Holy Names University. By the way we had our first SKYPE/LIVE piano recital on March 15th that globalized our lessons and brought students far and wide closer together. 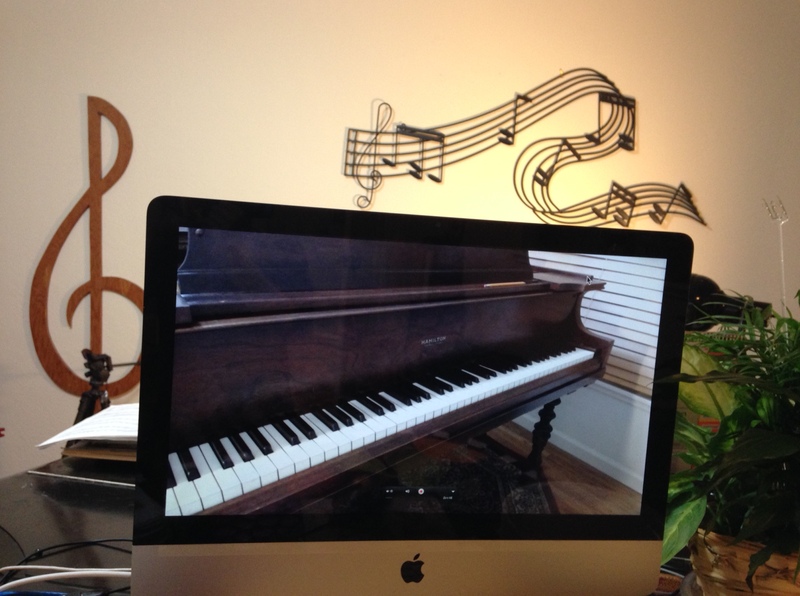 A SKYPE/LIVE adult piano student recital! Previous postA San Francisco Landmark and musical reunion! Great that it’s all possible with the technology around us, but i think a person to person lesson in real life is a total different experience, no? Yes, for sure. That’s why I do both.